Shared Hosting Vs Dedicated Hosting : Which is Best for You? Do you have a blog or website? or are you planning to create one? When it comes to create a new site or blog, there are so many decisions that you have to take before actually launching your blog or website. Success of your blog or website completely depend upon these decisions such as What will the focus of your blog? What type of audience you want to target? Should you use a personal tome or formal tone? What will be your domain and which hosting you should choose? When it comes to hosting a website and domain, both are crucial choice for a blogger or webmaster. But still bloggers usually ignore the importance of domain name and web hosting solutions. When it comes to hosting, you always need a reliable hosting and for that you need to make choice between shared hosting and dedicated hosting. Today I am going to explain what shared and dedicated servers are and what is te difference between both with benefits, so you can make choice which is best for you. If you are looking for a web hosting with good features and with lowest cost then shared web hosting option is for you. In Shared hosting many server programs run on a single hardware system and your server will be one of them . You usually share physical resources with many other clients who are also sharing the hosting space of same server. Because in this service cost of server get shared including bandwidth, maintenance and hardware of clients. This also means that like every other client you also get only portion of the speed and power of that server, which can somehow degrade the performance if few clients start using more resources then others. For example if your site on shared hosting service start getting more visitors than performance for other clients will be degraded and there are chances that your site get deactivated to reduce pressure on shared hosting server. Most shared web hosting is that services which offer simple, reliable and one-click management options for shared hosting servers. You may already know that there are unlimited options when it comes to set up a blog or website with WordPress or Drupal, But still hosting service offer limited options. Better customer support such as 24 hours support with specialization. You should choose the options and programs options available so you can serve better to your visitors. Still share web hosting is most popular choice to host blogs which are small and personal, but if you want to grow your blog or create form or add more content ten I suggest you to consider choosing dedicated server. 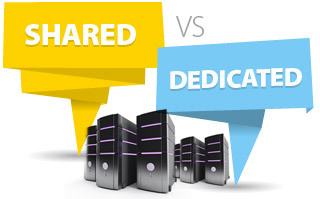 Dedicated servers comes with plenty of benefits that you can’t get in shared servers. But they have one biggest drawback and that is increased cost. Even starting cost of a normal-priced dedicated server be around $99/month or more. If you going to add additional features such as technical support, add on management, a firewall or you going to upgrade to more advanced dedicated server, then the price will increase dramatically. A high quality dedicated server with managed, services, powerful, fully-configured dedicated server will cost you over $1000 per month. Is this can be worthy for a blog owner? Reliability and security are the biggest advantages of having a dedicated hosting server as it also provide increased speed, more control, security and reliability. If you do not want to share your resources with other clients then dedicated server work best for you. You can hardly experience any critical failure as you are not sharing dedicated server with multiple clients. This also help you control and fix vulnerabilities. On dedicated server, everything stay under your control. Dedicated hosting service offer more control to your hosting. You need to choose operating system of your dedicated server and you can control everything very easily. If you want to run server administration then either you can hire someone to do the job or work yourself. You can also get various level of server management, from little intervention to full configuration. The more you give control to someone else the less you get charged but then it will be paying more, but it definitely help you to hire someone with experience to do server administration. You can also choose which features you want in your dedicated server. In the beginning blogger or webmaster usually have shared hosting server. Now you may be wandering when you should switch to dedicated server. If you ever see increased visits and slow server response or degraded performance of server then it is the time when you need to go for dedicated hosting server. Shifting to dedicated server will help you to fix traffic issues and server down issues in much better way. Now the question is who actually needs a dedicated hosting server. In the beginning shared web hosting server is a great choice for new website or blog, but if you want to add more features and want to offer more reliable service to your visitors then you will need dedicated server at some point. Shared servers often have issues such as vulnerable, slow and crowded. But Dedicated servers offers more expensive options and features without drawbacks of shared hosting server to offer you much better performance. So now you know that if you need a faster and more reliable site and want to offer more advanced features then you should seriously consider moving to dedicated hosting server. This will offer much better experience. Do share how is your blog hosted? Have you moved from shared to dedicated hosting? If you have any question or suggestion, feel free to ask via comments.